I don’t really have anything to write in this post other than these recipes. 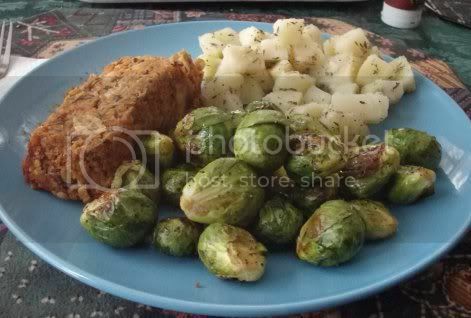 There were a couple slices of Not Meatloaf leftover that needed accompanying side dishes, and this is what I came up with. They’re both very, very easy and would go well with just about anything. Enjoy! And don’t forget to enter to win a copy of the awesome vegan blog ‘zine, Vstream! The contest is open until next Tuesday (March 29th), so there’s still plenty of time to get entries in. 1) Place a steamer basket inside a large pot with about 1 inch of water in the bottom. 2) Add the potato chunks and steam, covered, for 15-20 minutes, or until a fork passes easily through the largest chunks. 3) Transfer potatoes to a mixing bowl and add the lemon juice, thyme, and salt and pepper to taste. Toss gently to coat. Serve warm. 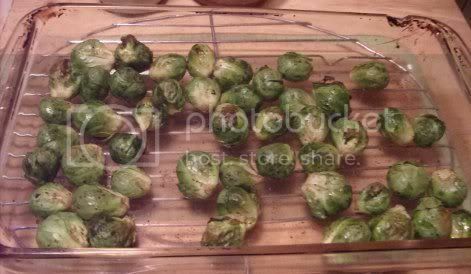 2) Place the brussels sprouts in a glass baking dish. Drizzle with the oil, add salt and pepper to taste, and stir to coat. 3) Roast for 15-20 minutes, stirring occasionally, until bright green and tender. Serve hot.